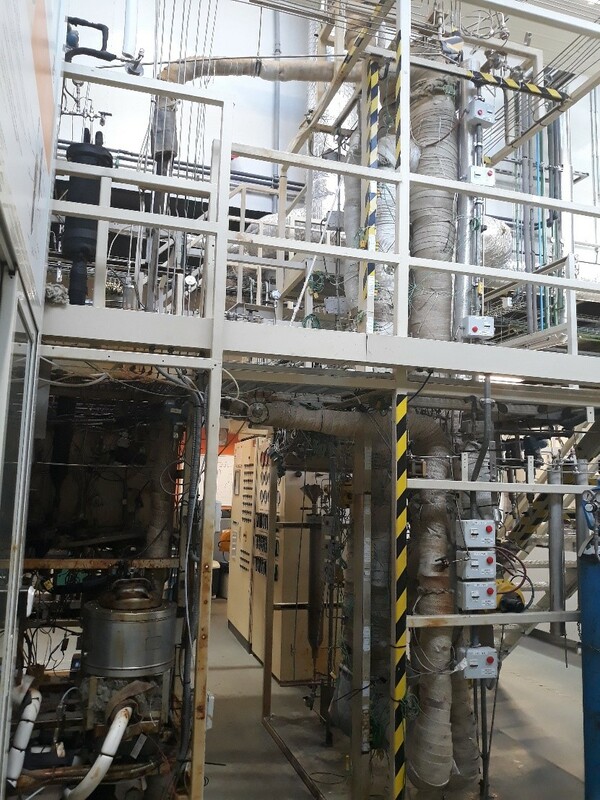 4REFINERY is a Horizon 2020 project that aims at developing and demonstrating the production of a next generation of biofuels, by integrating fast pyrolysis and hydrothermal liquefaction bio-liquids into a mineral hydrocarbon refinery. The world and Europe in particular, is facing major challenges in balancing future energy needs and the implications for the environment and is therefore focusing on increasing the use of bio-based products in its economy. An important component is the sustainable conversion of biomass into advanced biofuels, as this can significantly contribute to the decrease of greenhouse gases (GHG). In particular in the transport sector, by the achievements of the 80% reduction of GHG emissions targeted in the European Energy Roadmap 2050 compared to 1990. Biofuels can provide 27% of the total transport fuels by 2050, achieving reductions of around 2.1 gigatonnes of CO2 emissions per year when produced sustainably (International Energy Agency “Technology Roadmap – biofuels for transport”, 2011). The increasing demand for biofuels implies the need for transformation of diverse bio-resources into liquid fuels, which poses challenges in process development in order to improve conversion efficiency and improve overall sustainability, while decreasing the production cost. Biofuels production processes are expected to increase significantly in the coming years to achieve this potential. Thus, to meet the timescale and quantities needed while maintaining cost effectiveness, biomass implementation should be done through integration into existing refineries and infrastructures, avoiding the requirement of investment in new large bio-refinery units and infrastructures to support them. 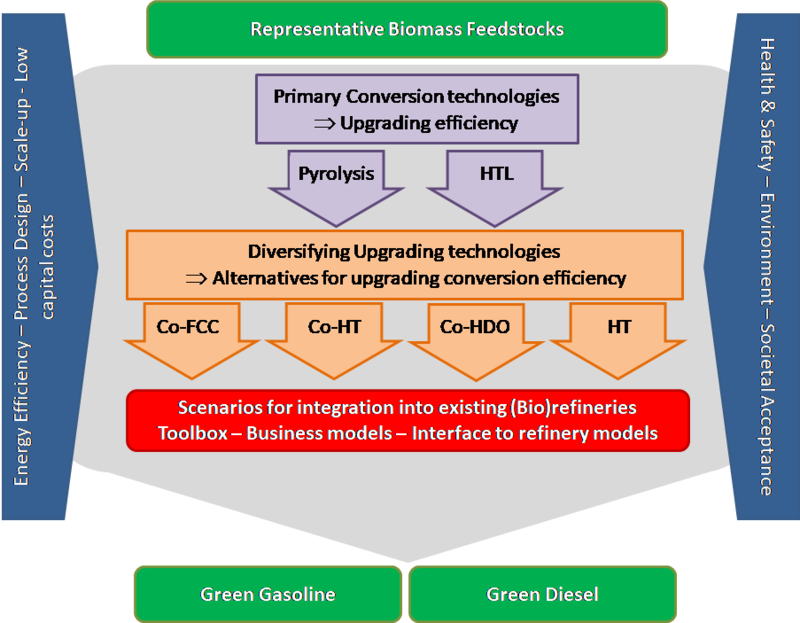 The complexity of the conversion of biomass compared to fossil oils (due to the presence of heteroatoms mainly as oxygen, as well as geographic diversity and availability) requires a primary conversion – liquefaction – step to allow easier and cheaper processing for transport, as well as for introducing these for upgrading in existing refineries. The most promising options today are fast pyrolysis and hydrothermal liquefaction, both facing a common challenge of implementation at industrial scale. As bio-feedstock specifications (ash, water, composition) will vary depending on the location, new methodologies are needed, based on an understanding of the relationship between feedstock specification and the optimal process parameters for best product quality. The 4REFINERY project started in May 2017 with the ambitious goal of advancing technology for the co-processing of advanced biofuels in downstream mineral oil refinery processes from TRL 3-4 to TRL 4-5. 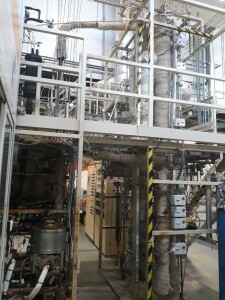 The main efforts of the project will focus on increasing the carbon yield from biomass liquefaction processes through various intermediate process steps: scale up testing procedures; define scenarios for the best further implementation in existing refineries, and develop solutions to answer key societal and environmental challenges. The project will focus on three major biomass feedstock types for the liquefaction pre-processing: forest residue, straw and eucalyptus. One aspect of 4REFINERY is to advance the primary liquefaction routes with the goal of providing an overall carbon yield higher than 45%. Another aspect focusses on the introduction of bio-liquids into two refinery processes: hydro-treating and Fluid Catalytic Cracking (FCC). Studying the entire value chain from biomass feedstock to blended fuel will provide the necessary knowledge on the effect of different biomass pre-processing pathways on the final product characteristics. Biomass pre-processing, or liquefaction, includes conventional fast pyrolysis and hydrothermal liquefaction. Pyrolysis is the thermal conversion of biomass at around 450-500 ˚C, in inert atmosphere, and ambient pressure to yield a liquid pyrolysis product. Depending on the feedstock, carbon efficiency of pyrolysis (biomass carbon to bio-liquid carbon) varies between 55 to 65%, while the remaining energy can be largely used for heat and power generation. Challenges include the removal of water and residual ash, reduction of acidity, reduction of the tendency of these liquids to re-polymerize and form char, and diversification of the feedstock basis while maintaining adequate quality liquids at high yields. Hydrothermal liquefaction is the high pressure (50 – 350 bar) mild temperature (<450°C) conversion of biomass, and yields a viscous but liquid product. Depending on feedstock and operating parameters, carbon efficiencies will typically be in the range of 45-65% while a significant part of the carbon from the aqueous phase can be retrieved into the oil product by full or partial recycling of this fraction. For lignocellulosic feedstocks, HTL produces a liquid with high aromatic content. Challenges include feeding biomass at elevated pressures (and reduce pressure), improvement in the product quality (amongst others viscosity, aromaticity) and improvement in overall process performance and reliability. The use of existing infrastructures facilitates rapid implementation of new developments at commercial scale and increases the competitiveness of the biofuel compared to fossil fuels. Co-processing experiments will be carried out at the pilot level in order to establish relevant energy and mass balances for further process optimization and economic studies. In order to realise the ambitious vision and objectives of the 4REFINERY project, leading research institutes, SMEs and major industrial actors, covering the entire value chain for the production of next generation biofuels, have been involved in the project. The 4REFINERY consortium is composed of 8 partners from 8 countries; CNRS, BTG, VTT, Repsol, MOL, AAU, E4tech and SINTEF. 4REFINERY has received funding from the European Union’s Horizon 2020 research and innovation programme under grant agreement No 727531. The total project budget is 6 M€ and the project will run until May 2021. 4REFINERY has a dedicated web portal, which is updated throughout the project: https://www.sintef.no/projectweb/4refinery/. Text provided by Duncan Akporiaye, SINTEF AS (project coordinator).